This must be the most famous of all dinosaurs. 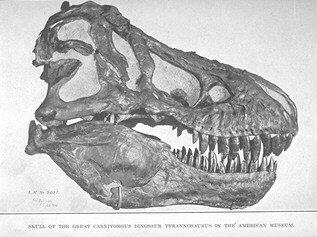 The first Tyrannosaurus rex was discovered by Barnum Brown in 1902 in Hell Creek, Montana.It was not a complete skeleton but enough existed to create a reconstruction of the creature. The first proper description of this creature was by Henry F. Osborn in 1905. 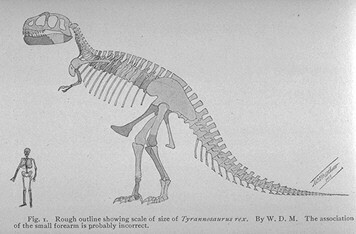 Henry Fairfield Osborn: 'Tyrannosaurus and other Cretaceous carnivorous dinosaurs,' in Bulletin of the American Museum of Natural History, vol. 21 (1905), pp. 259-265. In 1908 Barnum Brown found a second skeleton, again in in Hell Creek, Montana. The two skeletons now provided almost all of the T. rex skeletal material, save the fore-arms and some ribs. Consequently a full skeletal mount was created by 1915, using material from both finds. It was mounted in an impressive and dramatic stance, and stood in the American Museum of Natural History until 1993, when it was dismantled and reassembled into a more modern-day view of how the creature carried itself. More recent is the discovery in 1990, and subsequent reconstruction of Sue, a 41 foot long and 70% complete fossil female Tyrannosaurus rex recovered from South Dakota. The 'Santana Raptor', discovered in 2000, is presently suggested as a possible ancestor to the Tyrannosaurus rex.